Little Fish Are Sweet! : Louis XV? Louis XVI? What’s all the fuss about I can’t tell the difference! Louis XV? Louis XVI? What’s all the fuss about I can’t tell the difference! 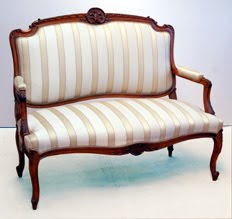 Louis XV is one of my favourite styles of furniture, with its curved ‘cabriole’ legs and elaborate carving and detail. I was doing some reading the other day to improve my history knowledge on the style that I so love. Louis himself ruled as king of France from 1715 until his death in 1774 and his reign saw great prosperity for the wealthy. Not surprising then that the furniture from this period is so incredible. I was particularly pleased to read that womens power increased significantly during this time, and the result was that their influence was felt both in the court and in furniture design. - Gilt and ormalu (gilded bronze) mounts.